United Airlines is adding new flights from its San Francisco (SFO) hub next year. Thrice-weekly service to Tel Aviv, Israel will launch March 30, 2016; thrice-weekly service to Auckland, New Zealand will begin on July 1, 2016 and expand into daily service next October. As previously announced, United will begin flights to Xi’an China, also thrice-weekly, starting May 8, 2016, for the summer season. All flights are still subject to governmental approval, and United intends to use the Boeing 787 Dreamliner on all routes. United Airlines will now offer Chicago-based Crafthouse Cocktails’ Moscow Mule on United-operated North and Central America flights, and Buffalo Trace Kentucky Straight Bourbon Whiskey on flights worldwide. A 200ml bottle of Moscow Mule will go for $12.99 while the 50ml of Bufflalo Trace will cost $8.99 in United Economy and be offered complimentary in premium cabins. United is offering eight celebratory flights—four from Chicago O’Hare International Airport and four from Houston’s George Bush Intercontinental Airport—where passengers may receive a free pour of Moscow Mule. JetBlue Airways has gone cashless at JFK. As of Oct. 9, 2015, the airline will no longer accept cash at the ticket counter as a form of payment. Customers who wish to still use cash can convert the cash to a prepaid credit card at a ReadySTATION kiosk. 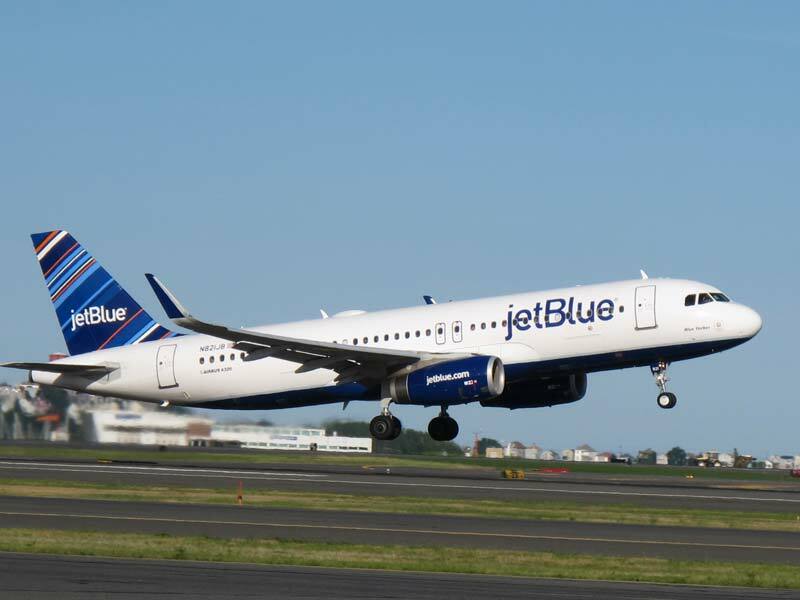 JetBlue also announced new, twice daily nonstop roundtrip service from Boston Logan International Airport (BOS) to Nashville International Airport (BNA) and daily nonstop roundtrip service from Fort Lauderdale-Hollywood International Airport (FLL) to Nashville. Service will launch on May 5, 2016. “All that and a bag of blue chips”—JetBlue unveiled its new T5 Farm at JFK. The farm, in conjunction of TERRA Real Vegetable Chips, will promote New York agriculture with a “farm-to-air” strategy. The farm will grow blue potatoes like the ones used to make TERRA Blues, the official snack of JetBlue. (JetBlue distributed more than 5.7 million bags last year.) The 24,000-square-foot farm will also fearture herbs and other produce. Travel Pulse reports that Etihad Airways will begin A380 service between Abu Dhabi (AUH) and New York-JFK on Nov. 23, one week early. Demand has increased because of the Thanksgiving holiday plus the 2015 Formula 1 Abu Dhabi Grand Prix, which is scheduled for Nov. 27-29. Delta Air Lines is the first U.S.-based airline to let customers purchase tickets with Apple Pay. Customers are able to purchase tickets through the Fly Delta app with this new feature. Delta unveiled its Mets-branded Boeing 757 at New York-JFK, celebrating the Mets’ return to the playoffs as well as the extension of Delta’s designation as the Official Airline and Official Private Jet Carrier of the New York Mets through 2023. In August, Delta trumped the other U.S. airlines with a completion factor of 99.9 percent and on-time arrivals within 14 minutes of schedule 85.5 percent of their flights. Delta also placed third for mishandled bags per 1,000 passengers. A new agreement between Delta and Aerolíneasa Argentinas will give American passengers access from Buenos Aires’ Ministro Pistarini International Airport (EZE) to Montevideo (MVD), Uruguay, and Mendoza (MDZ) and Cordoba (COR), Argentina, plus codesharing benefits. 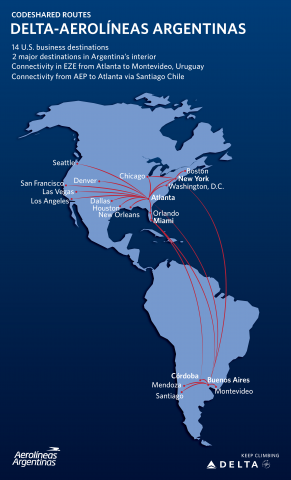 Delta passengers will also have access to Santiago from Jorge Newbery Airport (AEP), which connects daily to Atlanta (ATL). Travel Weekly reports that Finnair will expand its seasonal Helsinki-Miami service to be year-round, starting April 2016. The service will operate thrice-weekly. Finnair is also increasing its summer flights from three to five for the 2016 season. Travel Weekly also reports that Volaris, a Mexican carrier, will begin twice-weekly service between Durango and Chicago Midway on Dec. 8, 2015. Durango is an “colonial-era” city which hosts annual festivals and events.